The Cuisinart 77-14NThis deluxe set includes saucepans large and small and a universal steamer insert for endless meal options. The 10" skillet comes with its own tightfitting lid to let cooks lock in flavor and texture after frying or browning foods, and an 8" non-stick skillet provides added convenience for easy food release. 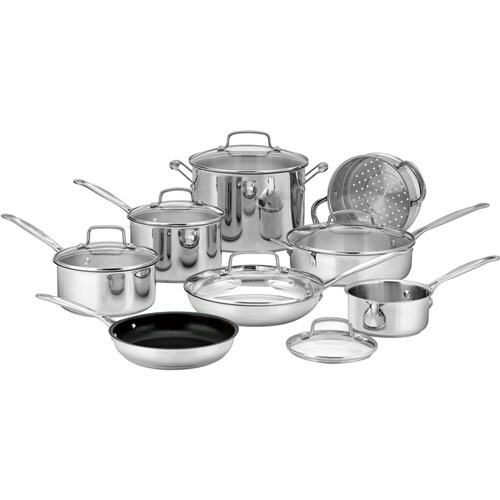 The Cuisinart 14-Pc Stainless Cookware Set has many exciting features for users of all types. You can extend the lifetime of your Cuisinart 14-Pc Stainless Cookware Set with the purchase of a FactoryOutletStore Factory Protection Plan. See the Cuisinart 14-Pc Stainless Cookware Set product video above for more details. 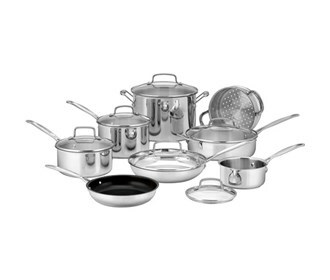 The Cuisinart 14-Pc Stainless Cookware Set is sold as a Brand New Unopened Item.